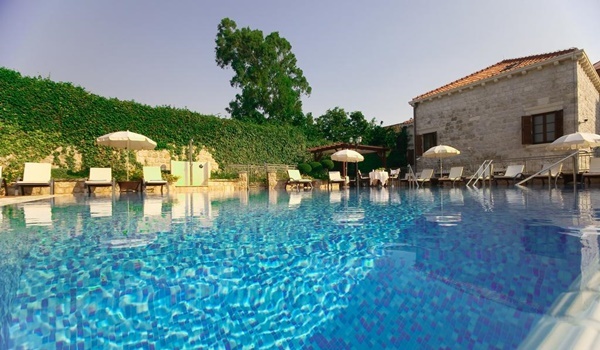 Hotel Kazbek is an exclusive hotel situated in Lapad, 3 km from Dubrovnik's Old Town. This hotel offers luxury accommodation. To reach hotel from Old Town you need to take city bus No.6 which will take you directly to the hotel. Hotel Kazbek has just 13 rooms available as a suite, deluxe or double room. All the rooms are spacious and elegant, decorated in a classic chic style with antique furniture. Room amenities inlcude en-suite bathrooms, mini bar, satellite TV, pay TV, safety deposit box, hair-dryer, bathrobes and slippers, exclusive toiletries, direct dial phone and free Wi-Fi Internet access. The hotel features three elegant dining and cocktail venues: The Main Restaurant with the Courtyard terrace and the Balcony Terrace overlooking the lively Gruz bay. The Kazbek Hotel offers a rich and varied menu with cuisines from all of the Croatian regions. From light fish specialities from the Dalmatian coast to rich meat dishes from Slavonija all accompanied by an extensive wine list. Guests of the hotel can enjoy in outdoor swimming pool with Jacuzzi. Lapad bay with numerous beaches is situated only a 5-minute walk from the hotel. Hotel Kazbek’s facilities include an outdoor swimming pool with whirlpool and sauna. A sailing yacht (10 persons & crew) and a speedboat (10 persons & crew) are located in the marina in front of the hotel. Both are available for private transfers and for excursions to the nearby islands. Hotel Kazbek has also access to a minibus for up to seven people. The Kazbek hotel is the perfect destination for a private party or corporate event in Dubrovnik. The hotel includes two fully equipped conference rooms (one smaller for up to 8 people and larger for up to 40 participants). All conference rooms are fully equipped with projectors, digital screen, internet connection and sound systems. At the hotel reception you can book a range of guided city tours and excursions to the surrounding area. 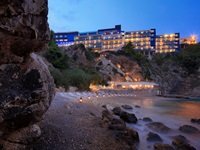 Pre-book your private car transfer to/from your Dubrovnik hotel safely and easily online! Rideways offers quality and professional transfer services to/from Dubrovnik airport & Dubrovnik cruise port! Free cancellation! 5-star Boutique Hotel Kazbek is situated directly on the coast of the bay of Gruz, only 3 km from the Old Town. If you arrive to the hotel by car, hotel can arrange a private parking for you. If you arrive by plane and taking an airport shuttle bus you should get off at Pile Gate and take city bus no.6 which will drop you off just in front of the hotel. Otherwise you can book your private car transfer from the airport. Bus stop from which you can catch a buses (bus no.5 & bus no.6) to the Old Town is only 5 minutes away.